The business related to the biotech industry and clinical trials in emerging countries. The balance between maintaining competitiveness and investing in innovation. These are the main themes of the Life Sciences conference at Casa Rio, which takes place on April 13, at Museu do Amanhã. Among the international names already confirmed as speakers is Michael Rosen, specialist in the development of global life sciences clusters and business. This will be the first sectorial conference in the Casa Rio program, which began in March, The event will also gather executives from the main national and international pharma and biotech companies, as well as researchers and government entities. In the worldwide scenario, the biotech and clinical trial market is predicted to reach US$ 445 billion in sales by 2019, according to studies by JP Morgan. In Brazil, the sector was bolstered by the Science, Technology and Innovation Legal Framework, which allows, among other features, that tenured professores be able to develop research within private companies and university laboratories to be used by the industry in the development of new technologies. 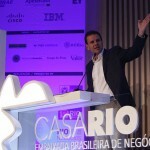 In Rio de Janeiro, in addition to the Legal Framework, the city’s new data transmission infrastructure has made it easier to consolidate information from digital medical charts of a population with a large genetic diversity, na essential factor for clinical trials, making Rio de Janeiro more attractive to companies conducting this type of activity.